Cameron threatened to kill him. He walked away holding Deana’s hand after Cameron’s death threat (i.e. making no effort to run or hide) but told her to run as Mr. Cameron approached and she was 50-75’ down the trail when the fight ensued. She did not include the death threat in her rendition of the event. She walked away holding Gary’s hand and was standing right there, 1-5’ from the action as the fight unfolded. She did not see Gary swing his small bamboo walking stick at Mr. Cameron. Cameron hit him with a 60-pound weight bar. Sommerville, Lentz and police agreed that no blood was found at the scene of the fight, nor was a blood trail found, though Mr. Sommerville was bleeding profusely from the head when flagging down motorists at the Columbia House gore point onto Highway 14. The defense asserted 25 reasons for doubt and highlighted 7 inconsistencies between Gary and Deana’s testimony. The defense emphasized Gary’s only photographed head injury showed neither the bruising nor swelling that one would expect a weight bar to cause; asserted Gary’s motive for making his claim was: get the girl and avoid jail. The defense highlighted Gary’s admission that he’d cut himself before going back to jail. The defense pointed out that Deana overheard Gary telling police about the weight bar, thus explaining why both would make this claim & concluded with what are the chances that a long heavy weight bar landed all injuries within the narrow confines of Gary’s Mohawk? “Guilty” of Felony Harassment-Death Threat. It was not 1st degree Assault because the State simply didn’t prove grievous bodily harm and further disbelieved the use of a “weight bar” (i.e. a metal bar swung as a club = deadly weapon which would be capable of producing death) to cause these injuries. Although defendant fractured Gary’s hand, which qualifies by jury instruction definition as a 2nd degree Assault, Mr. Cameron did so in self-defense as Gary’s hand was struck causing him to drop the hoe handle that fractured Cameron’s finger (a fracture testified to by physician’s assistant). Even though Deana Lentz didn’t testify about the death threat, neither side asked her about it, and in the context of what each side said, it made sense that Mr. Cameron made this statement. By rejecting the State’s 8-year offer for an Assault in the 2nd Degree plea, and risking 28 years if a jury found him guilty of Assault in the 1st Degree, Mr. Cameron (with an offender score of 9) was sentenced to 5 years in prison less credit time already served based on the Felony Harassment. Judge Stahnke ran his 364 days on the Assault in the 4th degree time run concurrent (meaning it will be served at the same time) and with good time Mr. Cameron should be free by Christmas 2018. Media coverage by The Columbian here. And this is why a: You have the right to remain silent so use it and b: You have the right to an attorney. 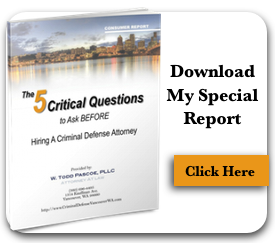 If you cannot afford one, here in Clark County, WA you will be appointed a highly skilled private practice attorney through our indigent defense pool of contract attorneys. These attorneys work for a pittance of what their retained clients pay them but like Todd, provide a top notch defense.